Leaves color dark green hairy in wavy lobed in triangle shape. Flower color yellow with five petals. Fruit not edible in green color the fruit explode when are ready in shape of cucumber with hair. 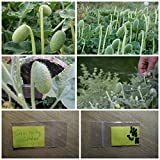 Squirting Cucumber ''Ecballium Elaterium'' - EXTRA RARE - 15 TOP Quality Seeds!